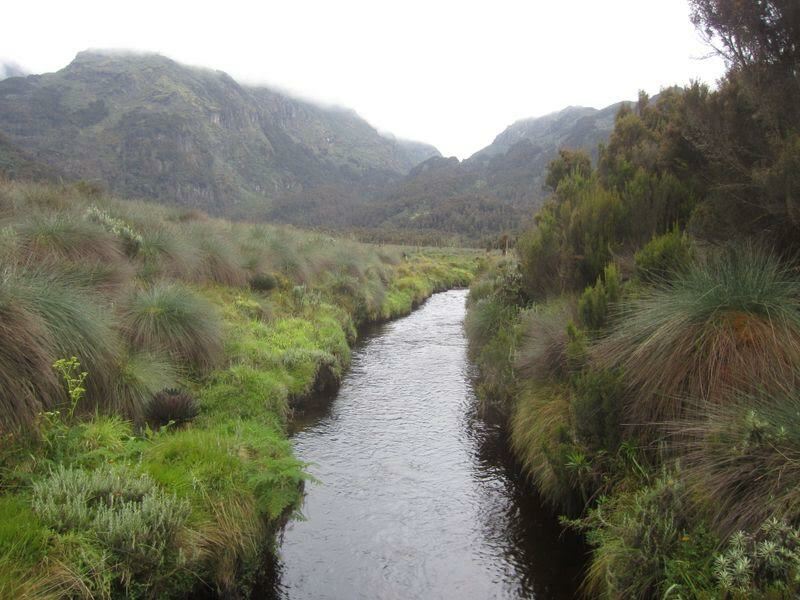 Uganda’s Rwenzori Central Circuit: Hiking on the Equator.The bog stretched to the horizon. Footprints of the dikdik, a miniature antelope wove around giant lobelia plants. Snow capped peaks beckoned. It was a fine spring-like day at 13,000’ in the Rwenzori Mountains of western Uganda, the fabled “Mountains of the moon” and the true source of the Nile. 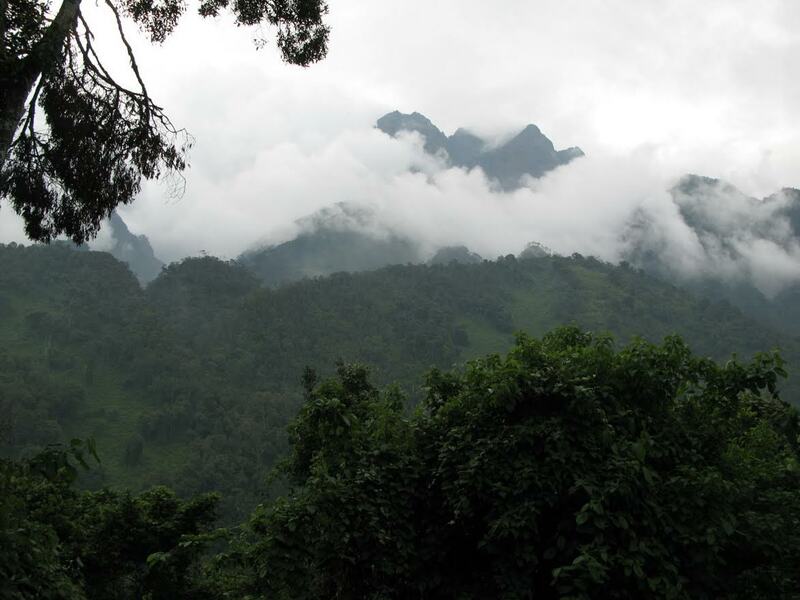 A UN world heritage site, the Rwenzori mountains, stretch some 80 miles along the border between the Congo and Uganda. While farming and settlement is intense outside the park, the lands within the park are respected by the people and are coherently managed. Moreover, important for tourists, visiting the park is safe. Uganda’s government has been stable for years and while Ugandans struggle for the basics in life, they are friendly and welcoming to tourists. 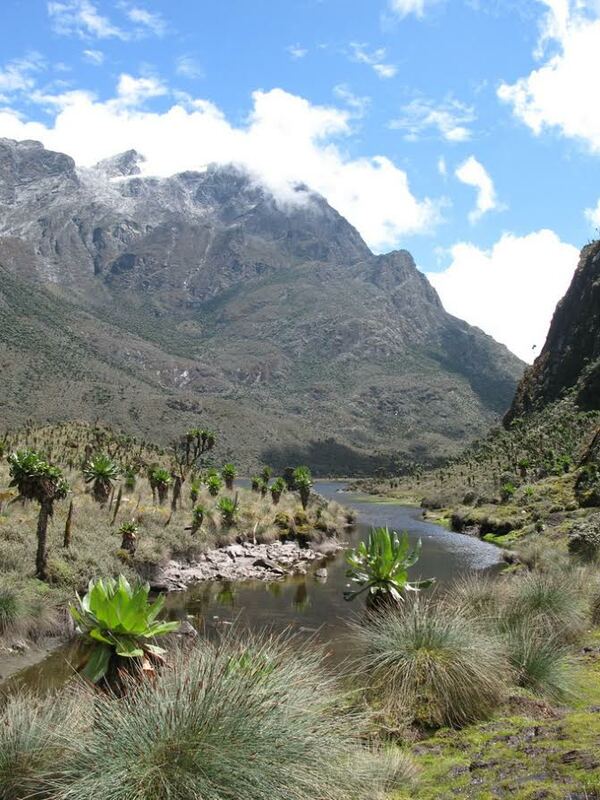 The Rwenzori get a lot of rainfall, as much eight feet of rain a year! The driest times and the best times to visit are December-January and late June to late August. Hiking has a long history in the Rwenzori. Henry Morton Stanley (of Dr. Livingston I presume fame) was the first westerner to confirm the presence of glaciated mountains on the equator, in 1888. The Duke of Abruzzi led an Italian mountaineering expedition to the Rwenzori in 1906 and named and climbed many of the peaks. The British have always enjoyed mountain walks and during the colonial era, the Uganda Wildlife Authority in partnership with the Uganda Mountain Club constructed a system of trails and huts known as the “Central Circuit.” All of the major peaks—Mt. Luigi di Savoia, Mt. Baker, Mt. Speke and Mt. Stanley (at 16,700’ the highest peak in Uganda (and the Congo) and the third highest peak in Africa)—can be climbed from the Central Circuit. The trail system and the huts fell into disuse and disrepair during the 1970’s and 1980’s, when Mt. Stanley was known as Mt. Idi Amin. With the reestablishment of a stable government favorably disposed to tourism, the US Agency for International Development, working with local organizations, invested $1.5 million in the 1990’s to reestablish the trails and rebuild the huts. Today, about a thousand western tourists visit the Mountains of the Moon annually. Perhaps half that many complete the Central Circuit and perhaps a hundred people scale the high snow and rock to the summits. It had taken an all-night flight and an all-day car ride across Uganda to reach Rwenzori National Park. My son and I drank Nile beer surrounded by misty jungle. We slept in a simple cabin under a mosquito net, listening to the roar of the mighty Mobuku River a few yards away. The following morning we walked through the village of Ibanda to Rwenzori Mountaineering Services headquarters, an unassuming compound that is the focus of much activity as the occasional trekkers come and go. Rwenzori Mountaineering Services is a non-governmental organization whose purpose is to promote the economic well-being of the Bakonjo people. One of the most enjoyable and interesting aspects of trekking in the Rwenzori is the opportunity to get to know the Bakonjo on your expedition. Our guides, cooks and porters all farmed small plots of bananas and coffee on the flanks of the Rwenzori. They work in the mountains to supplement their cash income, mainly to pay school fees for their children. It costs perhaps $100/yr to send a child to secondary school, so portering on a week-long trek brings enough cash to the family for one child’s school fees. We had an introductory briefing in a wooden cabin with a wall diagram of the classic six-day Central Circuit route. We planned to walk the route with an additional day set aside to climb Mt. 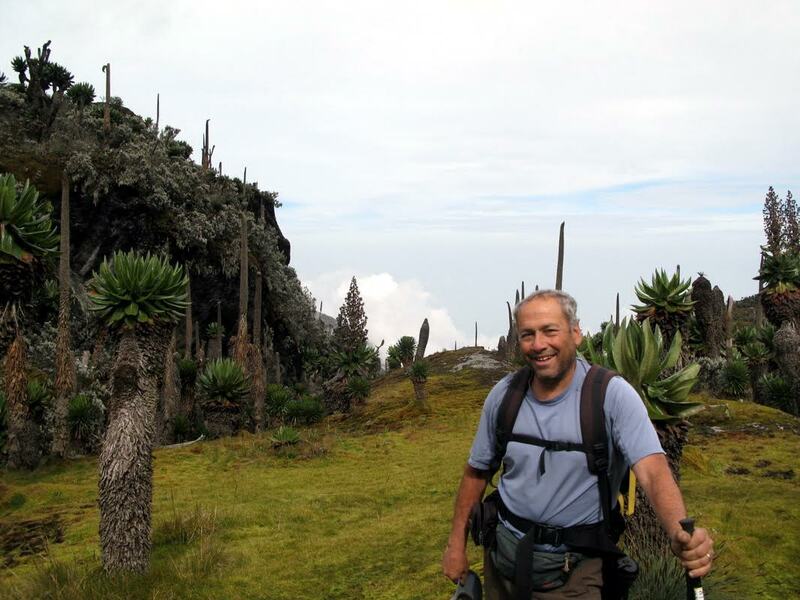 Stanley’s high point – Margherita Peak – the highest point in Uganda—and the Congo (as it sits on the border) and the third highest in Africa (behind Mt. Kilimanjaro and Mt. Kenya). We watched from the sidelines as Johnson was selected to guide our expedition. Johnson’s brother Colonelius, introduced himself as co-guide. Colonel had a big and frequent smile. Whereas Johnson would laugh pleasantly when spoken to, Colonel conversed in English, sometimes loquaciously. Matthew, a younger man in a floppy orange hat, signed up as a guide in training. Then a cook, Gabriel, was selected and a cook in training joined him. Johnson began to name porters in what looked like an auction. Villagers stared from the street into the fenced compound through slats. Other men and a few women milled around looking for work or sitting under trees that lined the property Our expedition of two tourist mountaineers ended with a team of twelve, including two guides, a trainee guide, a cook, an assistant cook, and ten porters. The porters make about $10/day and expect tips amounting to about $5/day. Guides make about $25/day and expect tips amounting to about $10/day. The porters carried burlap sacks on tump lines, bamboo or other strings tied around their foreheads and connected to the sacks. They even carried backpacks this way, refusing to use the shoulder straps. Rwenzori trails are rocky, muddy and steep. The first stage on the Central circuit is a 3,500’ climb up a ridge alongside and above the Mobuku River. We climbed through thick, broken equatorial forest and then through stands of giant ferns. We never saw a mountain elephant, but their footprints were thick on the trail. After four hours we arrived at Nyabitaba Hut, at 8,500’, a large cabin with several bunk rooms and associated dining areas. Armed park guards milled around in uniforms, presumably because of the nearby border with the Democratic Republic of the Congo. We descended on the second day to cross the Mobuku River at its confluence with the Bujuku River, then ascended through bamboo forest and moss-covered trees, arriving at John Matte Hut on the Bujuku River in about 5 hours. It was hard to believe that we were at nearly 12,000’ elevation. As on the first night, and every other, we slept in wooden bunks with dusty pillows and rubber-covered mattresses. Sometimes the guides would sleep in the hut with us. The porters and cooks were relegated to more primitive lean-to accommodations where they slept practically on top of one another. My son and I bathed in the Bujuku as the sun poked out through the mist. The porters laughed at us bathing. We laughed at how badly they smelled. During the meal, our cook, Gabriel, came in asking for medicine. I asked what was wrong. Gabriel rubbed his hands across his arms and body and said he felt “pains.” I surmised that he was cold. (We were all cold.) He nodded when I said the word “cold.” The Africans wore hand-me-down sweat pants, rubber Wellington rain boots without socks, windbreakers, and threadbare sweaters with bad Christmas patterns. Some wore slacks and ill-fitting button-down Oxford shirts. All had too few clothes for the chill in the wet air. I gave Gabriel my down parka and an Advil and Tylenol. He came back the next morning feeling better. The higher you go, the stranger the misty, boggy glacier-carved valleys of the Rwenzori become. The Bigo bogs start a few minutes beyond the John Matte Hut. Sometimes on boardwalks, sometimes mired in mud, rubber boots are the footwear of choice. Sometimes you are among giant heather, sometimes the bog sports giant lobelias, groundsels, and so-called everlasting flowers. The high bogs with their weird bog plants, thick mosses, giant heathers and draping lichens transport you to Tolkien’s “Middle earth.” The bogs lead you to Bujuku Lake and your first view of the high snowfields on Mt. Stanley. After four hours, you reach Bujuku Hut, at the far end of Bujuku Lake. Bujuku Hut (13,000’) is the jumping off place for Mt. Speke (16,043’). We had company when we were there. Two British brothers named Speke turned out to be the great great great grandnephews of John Speke, the British explorer who confirmed in 1862 that the Lakes and mountains of Uganda were the true source of the Nile. They had come to honor their famous relative by climbing the massive rocky peak rising up from the Bujuku pass (above the hut) that bears their family name. This illustrious party stumbled into the hut as we milled around trying to acclimatize with cups of Ugandan tea and Ugandan bee honey (made by international charitable cooperatives and sold under names like “Not Tonight Honey”). With climbing ropes, boots, ice axes, and other high-altitude equipment, the group looked ragged and overworked for their 16,500 foot success. They promptly fell asleep in their bunks. The fourth day on the circuit takes you over steep, rocky terrain with unearthly vegetation to the true alpine high country. We camped that night at Elena Hut, at nearly 15,000’, on the side of Mt. Stanley (16,763’). Perched under a cliff band , the toilet hole sits in a wooden shed across a small gully crossed by descending a ladder and then ascending a small rock band. Because the rocks between the hut and the outhouse are often covered with rime ice, “Going” in the middle of the night is considered the crux of the climb! The altitude stirred our heads. We drank tea and played rummy, crawling out of the hut periodically when the fast-moving mist rose. A sunset shot across the cloudy sky, bright pink and rippling. We snapped a group photo. Darkness descends quickly at the equator. We crawled in our sleeping bags by 8pm. We froze. The temperatures did not drop especially low – barely into the 20s – yet the alpine zone in the Rwenzori felt like one of the coldest places imaginable. Up at 2am due to the altitude and discomfort, we chuckled at the chill and the Spartan surroundings. Gabriel brought us hot water and porridge around 5am and, with Johnson, Colonel, and Matthew, we set off at 6am under a bright moon. The African glaciers really are receding, just as former Vice President and Nobelist Al Gore says. Elena Hut was constructed in 1951 at the toe of the Stanley ice field. Sixty years later, in 2012, we climbed for nearly an hour before reaching the snow line. We climbed through a cliff band with the help of a fixed rope. The sky lightened as we reached a long striated, rocky plateau. The day dawned clearly and the views were stunning, offering a clarity and reach that was moving. Rock turned to ice at the beginning of the Stanley plateau. While the climbing is not very technical, there are some steep drop-offs and crevasses. We roped up, attached crampons to our boots, and crossed the Stanley glacier, first up and then down. We descended a steep set of rocks, including with a fixed rope, and then crossed up to the Margharita glacier. Back on ice, we curved up past a nasty, gaping hole of black ice and traversed to the rocky summit approach on a snow-covered ice shelf. The shelf looked unstable, like it could set loose in an avalanche. Above us, a seraced, hanging waterfall of ice stared imposingly at us, with a black open maw like a giant frozen face. We were glad that this was not our first time on a glacier, or on a rope. 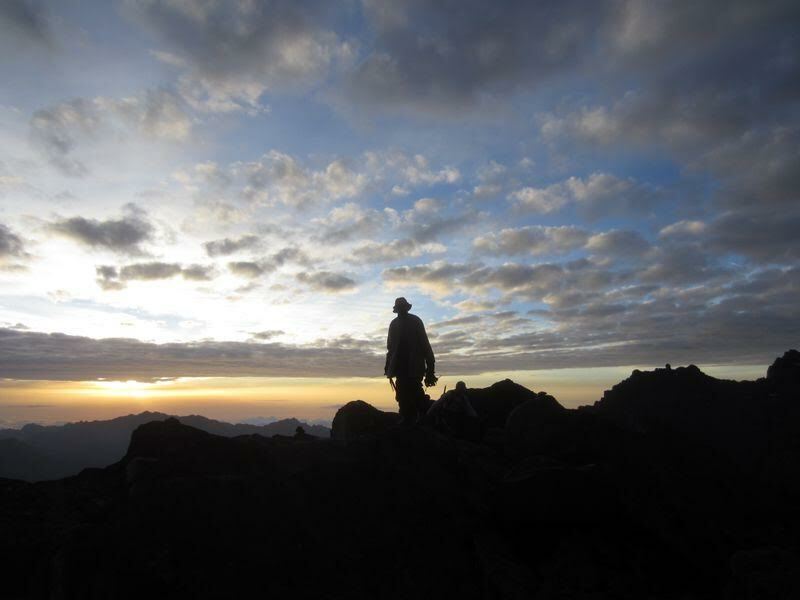 We looked out from the summit over the neighboring Congo and admired the other high peaks of the Rwenzori. Rugged, jagged ice fields flowed off the mountain. 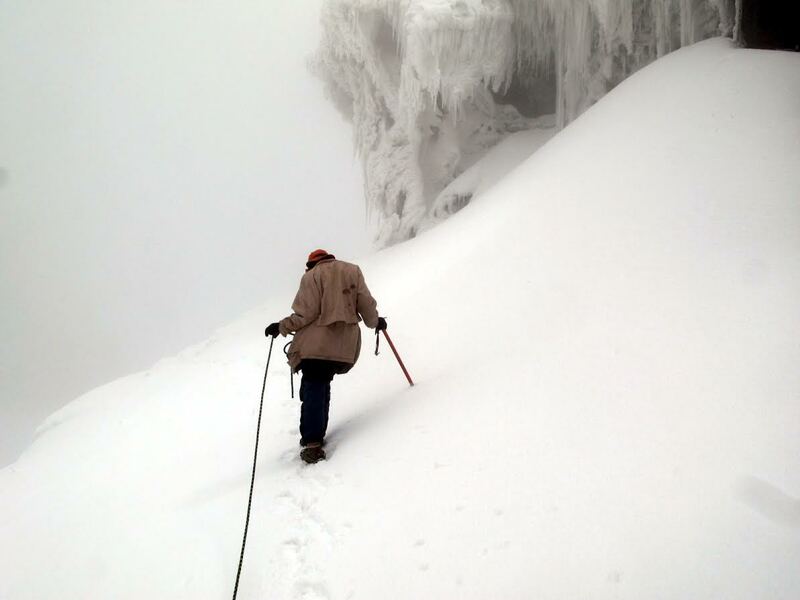 Our guides knew the route, but their technical mountaineering skills were minimal. They occasionally stepped on the wrong side of the rope and allowed a lengthy slack to build (slack in the rope can worsen the effects of a fall). Johnson and Colonel suffered from the altitude. Johnson in particular did not look well. (Two days later, in contrast to the rest of the group’s eager withdrawal from the mountains, Johnson appeared dizzy and unstable. He complained about a sore on his chin. His condition reminded us that Uganda has one of the highest HIV infection rates in the world.) After a slow return to Elena camp, we ate a hearty meal of ramen and vegetable soup. Colonel complained of a pounding headache and asked for medicine. I asked how much water he had drunk during the day. He pointed to his single, unfinished liter. I said, “Colonel, you are dehydrated and will feel better if you drink more water.” Colonel shook his head. “Drinking water makes you constipated,” he said. We handed out Ibuprofen and Acetaminophen. Porters and guides alike crowded around us like we were the Good Humor man. The summit was a big day. We left the hut at 6:30 AM, reached the summit at 11:30 AM, returned to Elena Hut in mid-afternoon, then completed one of the most beautiful legs of the circuit, the descent from Scott-Eliot Pass to Kitandara Hut (13,200’). We dropped steeply for a couple of hours through a spectacular valley flanked by enormous cliffs. As we walked, we looked back at Elena camp high above. Despite the long day, the beauty around us and the warmer, richer air lent a sense of jubilance. The twin Kitandara Lakes are bounded by cliffs and steep mountains. The groundsel plants and moss-covered trees make the foliage looks like an outtake from “The Hobbit”. The steely African sky reflected off the still lakes in the evening, and again in the morning. From Kitandara, the route climbs steeply up to 14,000’ Freshfield Pass. The pass is lush with green vegetation, and offers stunning views of the surrounding peaks, as well as views into the Congo. Guerrillas and war refugees inhabit some of the lower regions, probably just a few miles down. Up in the thin air, we had little worry. We continued over the pass and began a series of steep, cliffy, colorful descents that took us in one day from the 14,000’ pass back to Nyabitaba Hut at 8,500’, thus completing the Central Circuit. 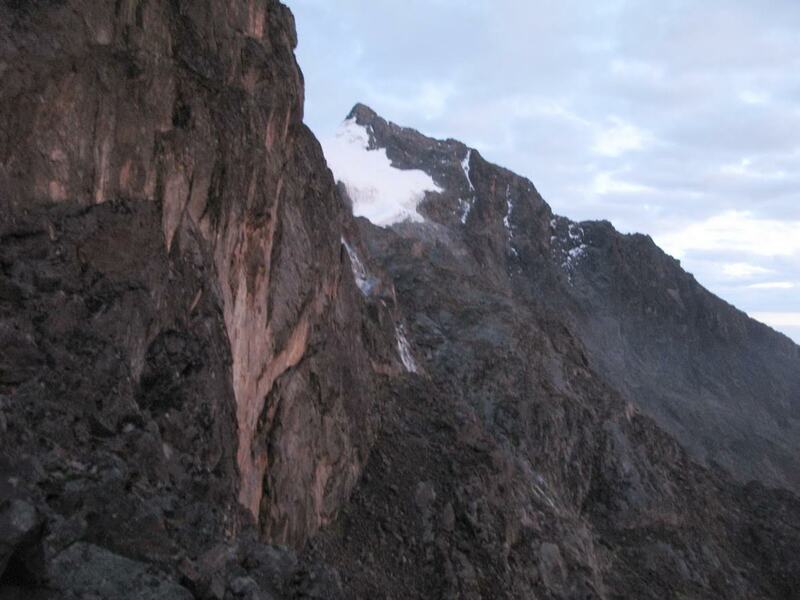 The steep descent offers some of the finest scenery in the Rwenzori. Lush, muddy, rocky, steep, and wildly colorful, the descent follows streams running down chutes next to cliff bands. The waterfalls and cascades in this part of the trip are spectacular. The route opens into a wide valley flanked by Mt. Baker on the left and a monstrous rock outcropping on the right. Lobelia covers the valley floor. To keep one’s boots out of the mud, one must hop from one tuft of marsh grass to another. Our final night at Nayabitaba camp, Gabriel prepared what food he had left, spaghetti and half a chicken. He said: “In the Rwenzoris, there are no bacteria so meat and other food last at least thirty days!” This explained why the morning sausages had looked as if they might get up and walk away. After dinner, Johnson informed us that we were expected to formally thank and tip our team. In a bizarre ceremony, almost comical in its formality, we publicly thanked each of our porters, cooks and guides with handshakes and cash tips. Spirits were high as we walked out on the final morning. Colonel babbled incessantly and convinced me to send him fishing tackle. Gabriel and the porters ran out. While walking through the village, Matthew pointed to his brother. “He is HIV positive,” Matthew said. He noted that many people are sick. I wondered if Johnson was ill.
After returning our Wellingtons and snapping another group photo, we hired a driver in a beat-up Subaru and headed off to Kampala. Whereas the driver on the way to the Rwenzori could not speak the language of the local Bakonjo people – Lukonjo – our Bakonjo driver had to speak English to others who spoke Luganda and other languages. As we drove through tea and coffee plantations past Ft. Portal and all the way to Entebbe, we reflected on the immensity of the natural and cultural experience we had just completed. Thirty thousand tourists a year visit Mt. Kilimanjaro in Tanzania. A thousand or fewer come to the Rwenzori. Nowhere else can you enjoy such stunning views of glacier and snow-capped mountains, fast flowing rivers, magnificent waterfalls and strange, stratified vegetation, right on the equator. Making the trip all the more worthwhile, visiting the Rwenzori, you will get to know the local Bakonjo people and your patronage will support their families very directly.